The Ukrainian student delegation was warmly welcomed to Wyoming High School by Principal Ashley Whitely and Assistant Principal Martha Sacks. 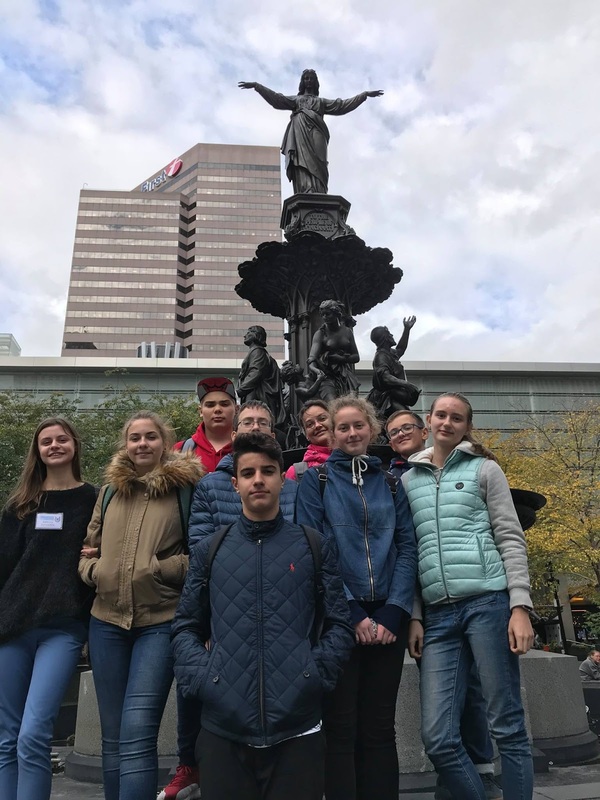 From October 21-November 6, Wyoming had nine new residents visiting from Kharkiv, Ukraine as a part of the Cincinnati-Kharkiv Sister City Partnership. 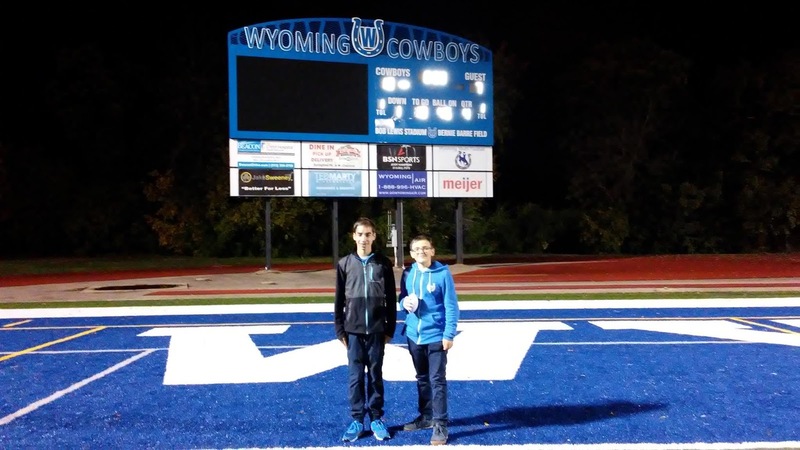 Eight of these visitors were high school students who attended class at Wyoming High School, and all nine Ukrainians lived in host family homes in Wyoming. This story was compiled by the Ukrainian chaperone, Nadiya Klymshyna, with the visiting students’ input. 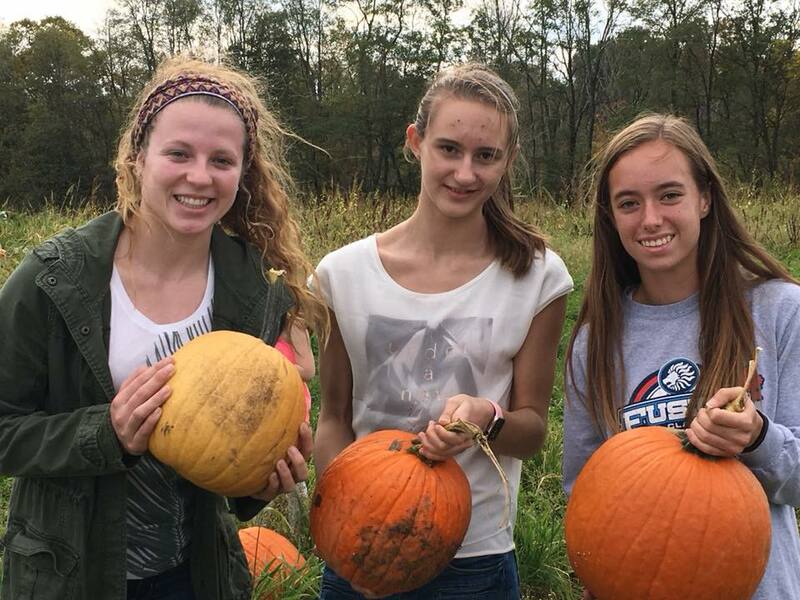 Many thanks goes to the volunteers from the Partnership - Bob Herring, Marilyn Braun, Ann Lampe, and Susan Neaman – along with the Wyoming High School (WHS) administration, teachers, students, host families, and the community as a whole. It takes a village to welcome these young Ukrainians to our little community! Nadiya with John and Marilyn Braun – the Brauns were her hosts for the two week visit. In 2012 I was one of the candidates of Open World program. We spent ten days in the U.S.A. - two days in Washington D.C. and eight days in Cincinnati. For me personally the experience was very useful, and I learned a lot about American life and people. We met lots of people who worked for the government, and it was so clear that our countries were, and still are, managed in very different ways. Also I understood that the other candidates were quite pessimistic about changes in Ukraine, despite the fact that we, as Open World program candidates, were invited to study American way of government management to apply it in Ukraine. So, if adults are so reluctant to believe in positive changes in Ukraine, it is better to invite teenagers, because they will build their future and the future of our country. It was my conclusion after my first visit to the U.S.A. 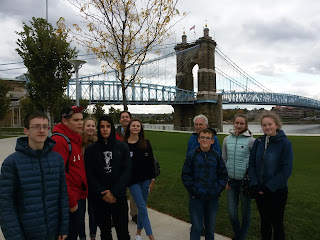 So, I kept in touch with Marilyn Braun, we discussed some ideas how to implement a project with a group of teenagers to come to Cincinnati to study and explore American lifestyle. Then, in 2016, in August, I met Robert Herring, who came to Kharkiv with Susan Neaman. After one hour discussion we had the draft of this project, which we developed into a wonderful plan afterwards via email. So, it took a year, even more, to plan, to think over every detail. 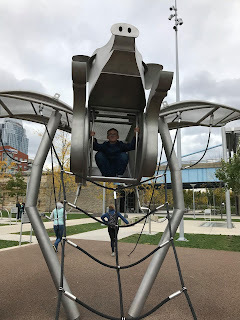 I published the information about this trip on Magic Camp site (magiccamp.net) and in October 2016 I had already seven participants who were ready to go and their parents were ready to sponsor their expenses. It was quite easy to find the participants, which was very surprising for me - the trip is not a cheap one for Ukrainians. The most important criterion was the level of English - the students were supposed to study all kind of subjects in English, so it was important for me to know if it was possible for them. Of course, the future participants filled in the forms and wrote their aims to visit the U.S.A., their readiness to study in American school was important as well. 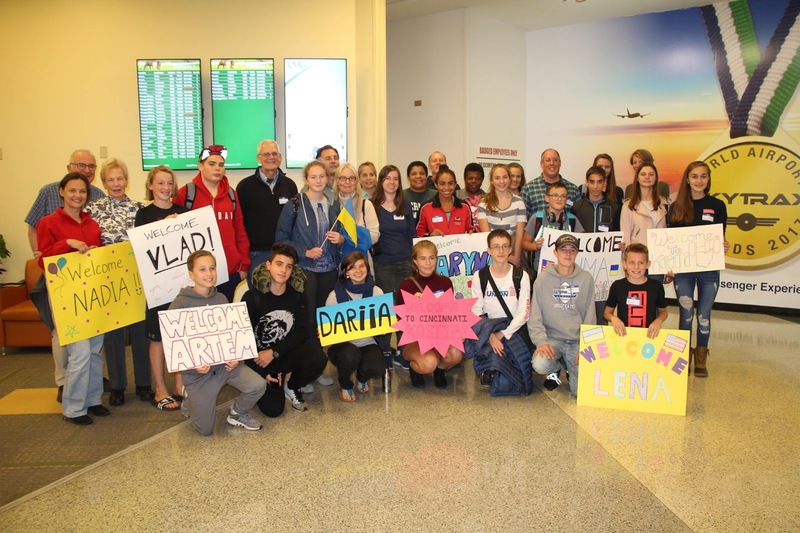 After several delays in travelling from Washington D.C. to Cincinnati, the Ukrainian exchange students finally arrived to many signs and family members. The best part of the trip was the fact that all my students knew their families before even coming to the U.S. They communicated to each other through emails or social nets and it was a great opportunity to know people they were going to stay with beforehand. 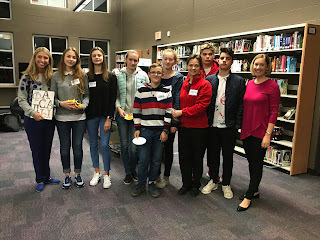 By the way not only the teenagers got to know each other, the American and Ukrainian families got to know each other, the parents from both countries were involved in the communication which made this trip so friendly and warm. The Ukrainian group, in addition to a few host family members, had a walking tour of downtown Cincinnati. There were nine people from Ukraine, I am sure all of us had different challenges, I can share mine. After spending three days in Washington, it was difficult to see my role in Cincinnati. My students were so involved into the school life and their new environment that I felt that I didn’t have a group anymore. When I saw that everyone was happy and full of plans and good impressions, I understood that the stay was so perfectly organized that my role was only for emergencies, which, thank God, we didn’t have. So I had to deal with the challenge that everything was working smoothly without my participation. I was impressed by such an organization. The Ukrainian delegation had two evenings with the Wyoming Police Department to learn about American policing. 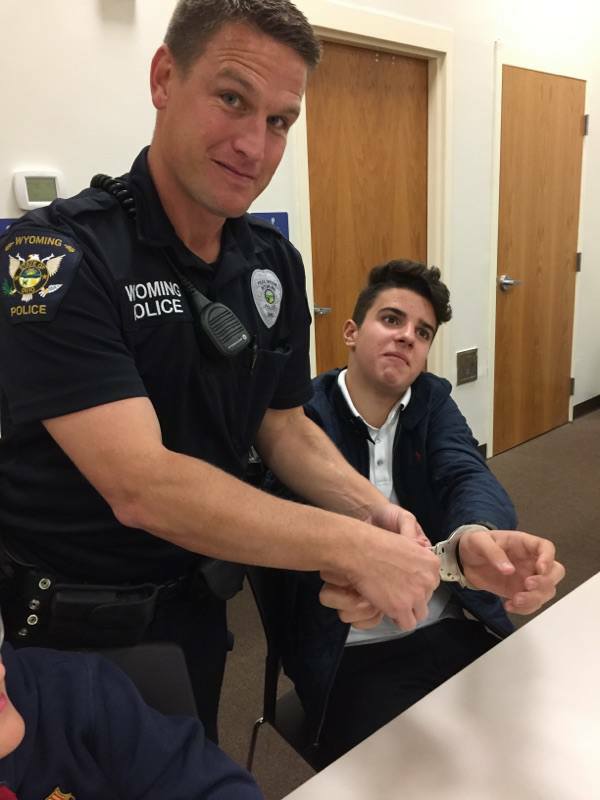 Here a Wyoming officer demonstrates handcuffs on Artem. I think that the school schedule was the most surprising for me and my students. In Ukraine our students have different schedules for each day as they have more than 17 subjects in a semester. At WHS, the Ukrainian students had the same schedule every day and first it seemed a little boring, but then they enjoyed it as it was a system of tasks which they had to deal with every day, and it got easier as you always remember what was yesterday and can apply the knowledge today. One of the surprises was also the Photography class. I didn’t know that the old way of developing films is still in use, and I didn’t expect my teenagers to enjoy it, but for some of them it was the best class ever. Wyoming Cowboys won two home games during the Ukrainian’s visit – here Eric and Dima pose in front of the scoreboard. I asked the Ukrainian students about the differences between American and Ukrainian schools and surprisingly enough, they mentioned friendliness of American teachers. It is a sad discovery, but maybe they are right. We, people in Ukraine, are usually very busy to pay attention to one person, especially teachers, they often say I have many students and I can’t be with one student only. But the American teachers paid a lot of attention to the students from my group, and that’s why they saw this difference. Of course the school itself - very big, beautiful, well-equipped. My students enjoyed the chemistry lessons because there were experiments, and the students were not controlled but monitored by the teachers. Most of them said that the sport lessons (physical education) were absolutely different, as they practiced different sport games, and they could listen to the music during these lessons, which is forbidden in Ukrainian school. Libby and Lucy took their exchange student, Lena, to a pumpkin patch. I had an opportunity to answer the WHS students’ questions about my Soviet childhood, it was so inspiring to hear the questions - the students were interested in the history of my former country and about my experience there. It was very personal, and at the same I felt that it was a part of history retold by a usual person, me. It was the first time in my life when I felt that I can help understand what happened in the history through my experience and make sure it will never be repeated by other people. After my conversation with the students, the next day one of the students told me that he got interested in that part of history and was going to ask his Russian grandpa and granny about their life in Soviet Union. So, WHS teachers, who invited me to such a meeting, and me, planted the seeds, and now we can hope to grow people with better understanding of history and people. 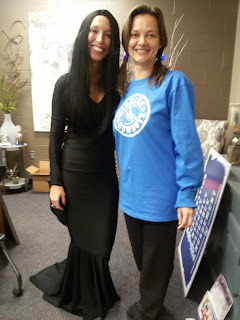 Wyoming High School Principal Ashley Whitely went all out for Halloween dressing as Morticia – and posing here with Nadiya. What would you like to bring back to Ukraine from Cincinnati? Kings Island, Photography lab, and Fiona (from the Cincinnati Zoo visit)! Skyline Chili? To tell you the truth, it is too spicy for us. I tried it without chili and it was still quite spicy for me. 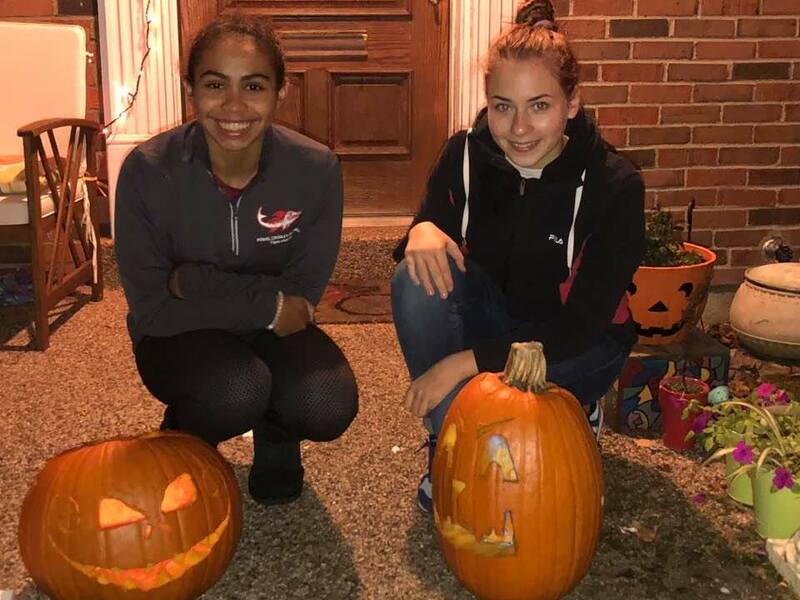 Mikaela and Daryna carved pumpkins together to celebrate Halloween. What was the fondest memory? The people, of course! The families, dinners with conversations, helpful and friendly classmates, calm and resourceful teachers of the school. The very beginning of our Cincinnati stay was just unbelievably warm and welcoming. I still remember my surprise to see so many people in the airport to meet us. Every family came to greet us, and there were our names on the posters and Ukrainian and American flags. We were so welcomed! And we felt it every day! I am sure everyone will remember the football game which took place under the heavy rain, but they will remember not the rain, but how strong and loyal American people are, that even the rain is not a problem when they support their team. There are so many stories! All of them are my favorite! But, I want to share the Halloween story. In Ukraine Halloween is quite popular as well and schools can have some special events after lessons. So I remember the announcement in WHS about the Halloween costumes, that everyone could wear one. I didn’t plan to wear anything special, I considered this holiday to be for children, not for adults. But I had a feeling that every WHS teacher was going to wear a costume and I decided to have fun as well. So I came to the school that Tuesday in a simple costume, and I saw some students in costumes, which was fun. I had an organizational question to the principal that day so I came to her office. When I saw her, well… I forgot the question! And I remembered that I didn’t have my camera with me because I wanted to have a picture with Mrs. Whitely! She was amazing! Even with long black nails! I learned that Halloween is a day to have fun and it doesn’t matter how old you are, just you should not be too old to enjoy some fun! 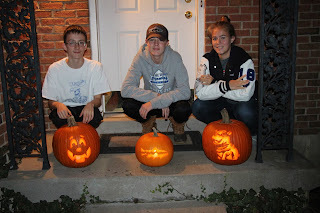 Kostya, Andrew, and Hannah proudly displayed their jack o‘lanterns. and the Growth of Democracy. 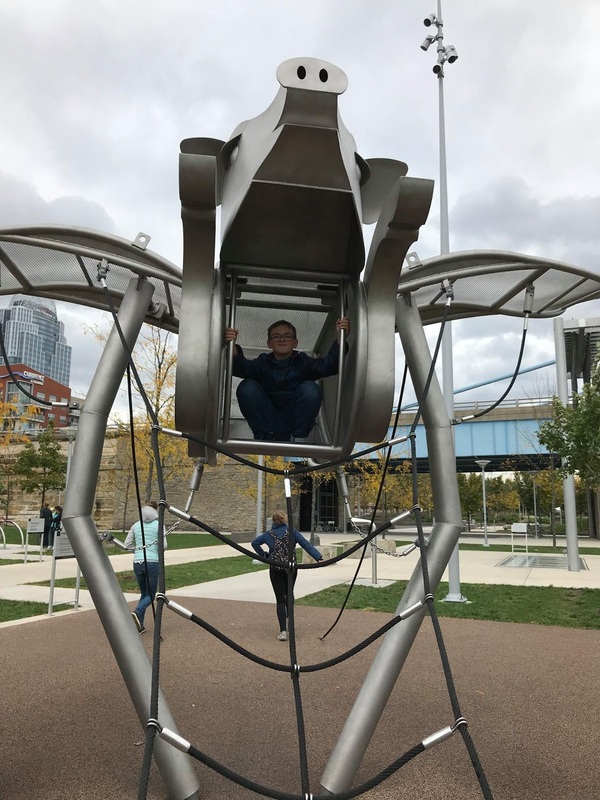 For the past 25 years, the people of Cincinnati have had the opportunity to help the people of Kharkiv discover the benefits and responsibilities of a free society, through cooperative projects in over 70 areas of mutual interest in the fields of business, culture, medicine, education, social issues, religious freedoms, and human rights. Our exchange programs bring groups from Ukraine to Cincinnati to work with Americans in business, government, education, culture, and medicine. We travel to Ukraine to share knowledge, make business and professional contacts, and expand understanding of the world community. 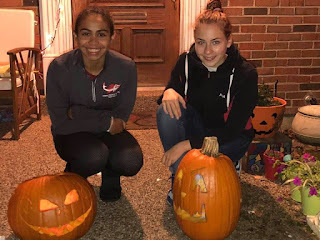 The Wyoming host families and their exchange students all went trick or treating together to celebrate a very American Halloween. Katya and Dorina dressed like cats with one another for trick or treating.